Deflate/Gzip compression is no longer a black box! The son of defdb and pngthermal is finally there, defdb is a good tool to scrutinize Deflate compressed data at a very low level but it doesn't give the "big picture", gzthermal tries to make it more visual and accessible to the average users (more features will be added over time to help distinguish literals from LZ matches and display LZ matches boundaries). gzthermal: displays compression efficiency heatmap of gzipped files. Output file is a PNG image called "gzthermal-result.png"
A previously non documented option is the compression level that can be set between 0 and 9 simply by adding a figure, for instance "gzthermal -ew9" should produce smaller output PNG files than "gzthermal -ew" (default compression level is 4). Regarding rendered text line width the default is 66 symbols, narrow 48 and wide 84. The input file has to be already compressed using gzip (or zopfli, kzip+kzip2gz, 7-zip/7za... it could also have been retrieved from a web server with gzip compression enabled), the resulting image file is usually quite big and may prove difficult to handle on resource limited computers. Currently non-printable ASCII characters are replaced by a small square, i.e. end of lines made of CR LF or just LF, TAB and Unicode code points that require 2, 3 or 4 bytes in UTF-8 will appear this way. You may have noticed that I have used an HTML document (http://encode.ru/ landing page) in my first sample, since HTTP/1.1 web servers usually compress text documents (html, css, js, svg...) on the fly using a Gzip/Deflate based compression tool, for instance Apache uses mod_deflate (which in turn calls the well-known Zlib) to send Gzip data. For the compression gurus familiar with the Shannon entropy it's pretty obvious, for the rest of the world red areas now mark bad compression locations. The same goes for charset="UTF-8" -> "utf-8" since based on the IANA Charset Reference: "no distinction is made between use of upper and lower case letters". Gzip/Deflate compression is basically LZSS+Huffman, the Variable Length Encoding (VLE) provided by the Huffman algorithm is applied to three different types of elements: literals (standalone symbols that are not part of an LZ match), the LZ length and the LZ distance of an LZ match pair. The number of bits used to represent a symbol is derived from its frequency of occurrence, basically symbols that appear often end up with shorter codes (say 3, 4, 5 bits, it also depends on the size of the source alphabet) and those less frequent end up with larger codes (say 8, 9, 10, ... bits). This type of VLE actually predates Huffman coding, Morse works this way, the Lineotype keyboard layout was driven by character frequencies. This effect of VLE on the LZ match components is a bit harder to grasp, for instance if there are way more LZ matches of length 5 (5 symbols replicated from a previous location) than LZ matches of length 3 it could lead to the counter-intuitive situation where larger words cost indeed less in the compressed stream than shorter ones. You'll notice that compression works better toward the end of files (more blue, darker blue) or at least after some amount of data has been processed (a few thousands bytes/symbols). The main reason behind this warm-up period is that early in the data stream the dictionary (or more precisely the sliding window here) is nearly empty and a lot of symbols/words appear for the first time, afterwards when a group of symbols/word/group of words appears again it will be replaced by a reference to a previous occurrence (that's an LZ match) and this saves a lot of space, hence blue areas. In comparison first occurrences appear bulky as if there was a tax associated to novelty. Here I moved some keywords around to see if it could help compression. "compression,data compression" have been swapped -> "data compression,compression"
This brings the second occurrence of "compression" closer to the first one, visually there's no difference, and effectively the references to "compression" have the same costs: 14 bits be it 17 or 12 bytes away ( (12,17) and  (12,12) in defdb), but the reference to "ta " (end of "data " duplicated from "meta ") costs one bit less ( (3,42) vs  (3,30)) this unfortunately did not appear since both 13/3 and 12/3 give a value greater or equal to 4 and strictly lower than 5 leading to the green color, nevertheless a good move. "zip" has moved closer to "7zip", "zip,rar,ace,7zip" -> "rar,ace,zip,7zip", this time the "zip," found at the end of 7zip is a bit darker and it costs effectively 1 bit less ( (4,13) vs  (4,5)), good move. "paq" has moved to the end of the paqx series, "paq,paq6,paq7,paq8,paq9" -> "paq6,paq7,paq8,paq9,paq", this led to more regular back references ( (4,4)... (4,5)... (4,5)... (4,5) vs  (4,5)... (4,5)... (4,5)... (4,5)) but no saving at all. So far it looks like the compressed stream sizes should differ by 2 bits... and the tricky thing is that it's not the case, the second one is 3 bits shorter (and due to byte rounding an entire byte less). Huh?! How is that possible? More header analysis to come... did not really expect this one to be that complicated. Rule #2 move similar words closer together to reduce the distance cost in the LZSS pair. UglifyJS2 apparently does some basic stuff like counting character frequency but still struggles with gzip compression, I think gzthermal and defdb could pave the way to overcome this type of problem. Just to prove a point, here is a gzipped JPEG image (the .jpg.gz file is a tad smaller than the .jpg file 16494 vs 16567 bytes. To be clear: don't do this, it's not worth the CPU cost!) and the head of its compressed representation, it shows that the sole part of the JPEG file that could actually be compressed is the header mainly the content of the DQT (Define Quantization Table) chunk, the remaining of the file is in the same red tones. 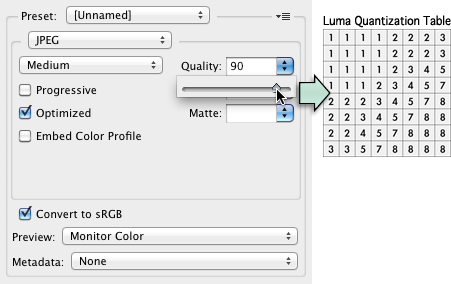 The Quantization Tables -QT- hold the "quality" setting of the JPEG image (yep, it's a bit more complicated than a single value picked with a slider in Photoshop, but this is really how it works!). Each QT holds 64 values (usually 8 bits values, they turn into 16 bits values when a lot of JPEG "quality" is sacrificed). Notice that there's a lot of redundancy in these tables which should naturaly lead to good compression all the more so since the tables are actually recorded following a zigzag path. Basically it says that the data stream consists of 43 values 1, followed by 11 values 2 and finally 10 values 3. What took 64 bytes uncompressed only takes 9 bytes and a bit (73 bits) in a Deflate/Gzip compressed JPEG, unfortunately that's the sole part of the entire file than can be easily compressed, and this sample is quite extreme since usually QT tables hold more than just three different values and the zigzag path does not always magically remove all the complexity of the table. Another spot that shows some signs of compression is the content of the DHT (Define Huffman Table) chunk that follows the FFC4 marker. Here is a slightly different heatmap view, where the JPEG markers appear and the entire DQT and DHT chunks are underlined, once the Start of Scan marker is crossed (FFDA marker) Deflate/Gzip will only face already compressed data which is extremely hard to compress a gain hence the red area that unfolds till the end of the file. Some advanced packers like PackJPG actually uncompress this layer, compress it with a different engine and recompress it as it was before during their uncompression phase. Data Compression Explained by Matt Mahoney holds a chapter dedicated to JPEG Recompression. And before you ask: yes I plan to add a binary/hex mode to gzthermal. New version 0.3a with binary/hexadecimal mode (-b), and even smaller font size (-e). Linux ARMv7 for test, Windows version in a few days. First post updated. It would be interesting to see some examples of compressing uncompressed binary data of various kinds, using the hex output option, to see strides and other patterns in how gzip responds (or doesn't) to various regularities. If you can vary the row length in your pictures, you can probably make various data structures pop out in interesting ways. When I get around to it, I will try using gzthermal in conjunction with those other plots, to see which "obvious" regularities are or aren't exploited by gzip. Do you have the option of turning off Huffman coding, so you can compare/contrast to see how much compression you're getting from LZ string-matching and how much is from entropy coding literals or offsets? That sort of compare/contrast could be very useful in designing simple preprocessors that make non-Markov regularities more obvious to a back end universal compressor, and actually see how the rubber meets the road or fails to. Originally Posted by Paul W.
I may add an option that would allow to freely set the line width. It is a program that inputs a file and produces a file fv.bmp showing the location and distances of matches using different colors to indicate match length. Yes, that's the fv I meant. I just started another thread with an example of using it with a couple of handy filters. Or I suppose you could change the colors of the characters, using grays vs. white, to encode a different channel of information, e.g., how much you're benefiting from Huffman. I'm sure there are lots of ways this would be trivial if I was good at any particular relevant thing (e.g., generating HTML that messes with background colors and letter colors, or making ASCII art photo renderers), but I'm not, so I'm looking for an appropriate library to use or program I can adapt. A few posts in, I use a couple of hex dumps to show certain patterns that show up in straight hex, and others that show up in the ASCII-interpreted columns. If I could just colorize the hexdump to point up qualitatively different kinds of values (e.g., numerically small binary values, letters that are very common in text like _etaoinshrlcu, common x86 bytecodes, etc. ), a lot of different kinds of data would have visually obvious signatures, and you'd be able to see things like strides in certain qualitatively different fields of repeating structures, or where you have 8-bit ASCII vs. 16-bit Unicode text strings embedded in mostly machine code, etc. If you reserve black and white for hex 00 and FF, a lot of binary data will have very distinctive columns or diagonals of black and/or white pixels, indicating that you very probably have binary numbers of certain sizes at certain strides, because their high bits are usually zero, or FF if they're negative. E.g., 16-bit stereo WAV file will regularly have stretches where have every other whole column is white for a while, then black for a while when the waveform crosses the zero. Mapping other small binary numbers to a range of blues, with smaller being lighter, would make that work even better. I think that'd be a very useful complement to gzthermal and fv, letting you look at the data itself in a useful way, before you interpret it as string matches and literals or string matches and match distances. It's not open source, but a could eventually modify gzthermal in such a way it could do what you are looking for and hand it over to you (check your private messages). The way it works now limits the backgroud colors to 17 and text has to be white (It uses prerendered semi-transparent charset images, no real text compositing). If they're in a pnm format, e.g., or some format you can easily interconvert with that, I think it's easy in Linux to convert them to alpha masks with something like ppmcolormask(1) or the -transparent option to pnmtopng(1); just give it a color argument saying that the white bits (the white character parts) should be transparent. Then you can easily composit your transparent-letters-on-colored-backgrounds with any colored rectangle you want for the actual character using pnmcomp(1). The easy way to do it without depending on having those libraries on your platform would be to just have b * c * 256 versions of your characters in a big 3D array, where b is the number of background colors, c, is the number of character colors, and n is the number of data values (256). If n and c are each 16, that's 16 * 16 * 256 = 64K, which if your glyphs are, say 12 x 16 pixels each is about 64K glyphs * 192 = about 12 megabytes. It's ridiculously fat, but very simple and portable, and for a visualization tool, who cares about 12 megabytes? There's presumably an easy way to do this cross-platform in Python with the Wand module, which as I understand it is a simple basic interface to the ImageMagic library. (There are other less-simple ones, but I'm guessing Wand would do fine.) I assume that would be plenty fast to composit the characters glyphs with colors in real time to display a page of legible text, and not require stories bunches of copies of the same glyphs with different coloring. Unfortunately I'm not really a Python programmer yet, but if you are, that might an easy portable way to go. Paletted PNG with many transparent colors, but only the heart of the compressed image is in fact stored. The glyph image had 16 palette entries (14 are partially transparent, 1 fully), since only bright white is non transparent it is shared among all the "sub palettes" in the final 256 colors palette (1 + 15x17: 1 white, 15 transparent colors composited over 17 different backgrounds) the solid colors are computed on the fly (if you want to hack the background colors used by gzthermal... look for: 0x00,0x05,0x60, 0x02,0x3D,0x9A, 0x00,0x5F,0xD3, 0x01,0x86,0xC0, 0x4A,0xB0,0x3D, 0xB5,0xD0,0x00, 0xEB,0xD1,0x09, 0xFB,0xA7,0x0F, 0xEE,0x00,0x00, 0xD0,0x00,0x00... in the binary executable, these are the RGB values used to define the colors, the first one is night blue). Of course I could produce a truecolor PNG and start with a higher quality font rendering, but the resulting image files are already damn huge and the increased quality would be barely noticeable. Last edited by caveman; 16th May 2014 at 01:24. ... but these tools and a few filters, as-is, make a nice complementary suite, which I can script or use manually much, much, more efficiently than I was doing before. Neato. Now I can actually see various regularities and their consequences, and some things I've been stupidly speculating about for years. Sweet!